Next speaking engagement: April 26, Menomonee Falls, Wis.
Posted in Uncategorized. Tags: homemade wilderness, Joy Buslaff, Wild Ones. 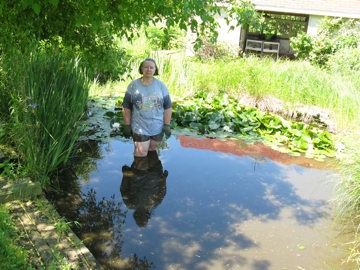 Comments Off on Next speaking engagement: April 26, Menomonee Falls, Wis.
I’m Joy Buslaff, former editor of Wild Ones Journal and former deputy editor of The Ecological Landscaper, seen here standing in the shallows of the 20-foot-diameter pond I hand dug. Every few years I jump in to manually dredge the pond weeds which will enrich the compost pile. My posture may not convey it, but I actually enjoy mucking about and reveling in a wetland experience where we once mowed lawn. Dan Savin, my husband, and I are consummate do-it-yourselfers, relating to both landscape and building restoration. We hope to encourage your growing an ecological landscape with native plants through the news and instruction provided via this site and my speaker programs. During the earlier years of our marriage, we transformed the building and landscape shown in the two before/after photos below. Today we happily rent this property to appreciative tenants. In 2001, we inherited my parents’ home, best known as Quarry School, an 1868-built stone schoolhouse. Contact us by emailing homemadewilderness@earthlink.net. Sincere thanks to those who attended! Posted in Uncategorized. 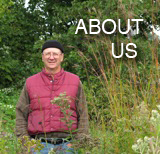 Tags: ecological landscaping, homemade wilderness, Joy Buslaff, native plants, natural landscaping, Wild Ones. Comments Off on Sincere thanks to those who attended!